Dundalk FM would like to invite you to come along to a Coffee Evening this Thursday 10th May between 7pm to 8pm. Are looking for a new hobby? Are you thinking about a third level digital media course? Do you have an idea for a music or community based programme or would you just like to see the studios? We are looking for people like you to join our team of over 81 voluntary community radio broadcasters. You will be invited to take the first steps into broadcasting by recording a one hour show about your favourite band or musician for our weekly ‘Spotlight’ series’. 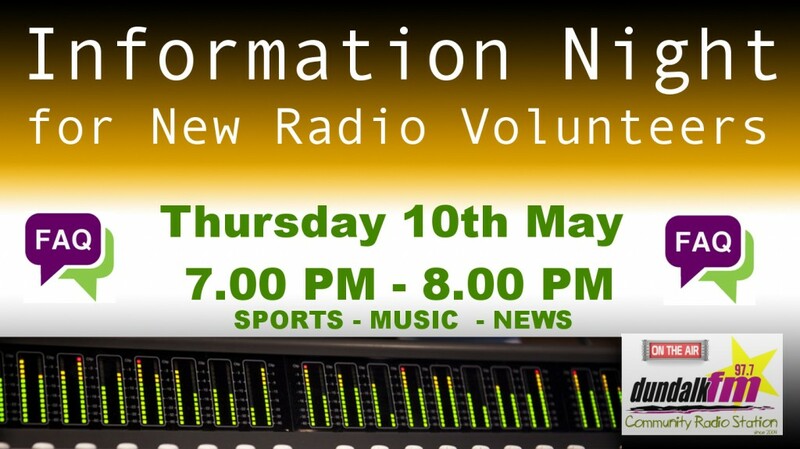 So that’s a date for your diary – Thursday 10th May from 7 at Dundalk FM Studios, Partnership Court, Park Street, Dundalk.